If an efficient way to destroy a culture is to destroy it’s language (or simply kill off it’s population), then a good way to honor a culture is to learn it’s language (and leave the people be) – likewise for a culture’s artistic heritage. But a culture’s visual language can take on a curious life of its own while traveling through the ages. So, let’s talk delft. Delft is a creole ceramic expression. What began in the Arabian peninsula as a blue decorated tin-glazed response to white Chinese porcelain traveled back to China and then sprayed out in various forms, blanketing the globe. Each stop along the way sprouted whole new styles of expression (like delftware), even as local potters freely drew from what came before. How cool it would be to trace this language by following a single image or decorative device along it’s entire historical arc! By seeing that image express change and/or constancy in the hands of an Arabian, Chinese, Indian, Yemeni, Persian, East and North African, Turkish, Spanish, Italian, French, Dutch, English, Irish, or Mexican potter. Maybe curators, collectors, or scholars could identify such an image. I can’t. The big picture is too sprawling. I’ll have to do like the old potters did and make my own ‘little picture.’ This one begins with a collision of two motives – to paint a fish (thus joining the ranks of fish-painting potters), and to wrap my head around an ‘Italianate’ delftware border pattern – combined with a diminishing inventory of blank plates as the clock ran out before a show. Floating in the background were a 12th century Yuan Dynasty export porcelain bowl intended for the Indian Ocean trade, an early Dutch plate possibly made by an immigrant Italian faience potter, an obsession with Southwark floral imagery that creeps into every unguarded corner when I decorate, my brush and stick learning curve, a vague possibility that I may be related to early Delft potters, and a healthy dose of repetitive muscle strain. Can one respectfully interpret the range, spirit, and boundaries of a historical style while still telling a unique story? Who knows? On the other hand nothing the potter makes exists within, or comes from, a vacuum. The technique was loose and sloppy. The imagery bordered on abstraction. The finished product seemed almost tossed together. But closer examination reveals an intense, studied effort. This was 17th century delftware from Southwark on the Thames River, opposite London. What was going through these potters’ minds? More to the point, what was going on right outside their doors? Potters, along with painters, glaziers, weavers, metal smiths, wood workers, and artisans of all sorts congregated in Southwark from the 13th century onwards. Musicians and actors (including Shakespeare and the famous Rose Theater) joined them. London’s guilds continually petitioned the crown to evict, tax, restrain, or otherwise punish those nasty alien ‘job stealers.’ Guild vitriol curiously belied sentiments echoed a little over 100 years later in the newly independent United Colonies of America – that handiwork of foreign artisans seemed superior to local products. Back in Southwark, restriction had its advantages. The London guilds’ more extreme efforts rarely stuck because Southwark was outside the authority of London’s bailiffs. Southwark was a multicultural and aesthetic melting pot spiced with a righteous dose of siege mentality. The scene was further powered by caffeine, an exotic new stimulant then flooding English society. Other English delftware pottery centers of Norwich, Liverpool, and Bristol – port towns all – were similar ‘wretched hives of scum and villainy’ (to paraphrase a famous traveler from a galaxy long ago and far away). These were the dodgy environments that produced some of the most creative art of the era. The Graves Are Walking. John Kelly. Macmillan/London. 2012. Backing up a bit, blue dash chargers were made from the early 17th century, initially as English spin-offs of faience from Urbino, Italy, until the 1720’s. Blue dash sported a bright color palette of blues, greens, yellows, and purples. A row of blue daubs around the down turned rims set blue dash apart from other English delft. “Chargers” were made specifically for serving large chunks of meat. Surviving blue dash chargers defy that function by showing no sign of wear. Holes poked through the chargers’ feet to facilitate wall hanging also belied the standard charger function. 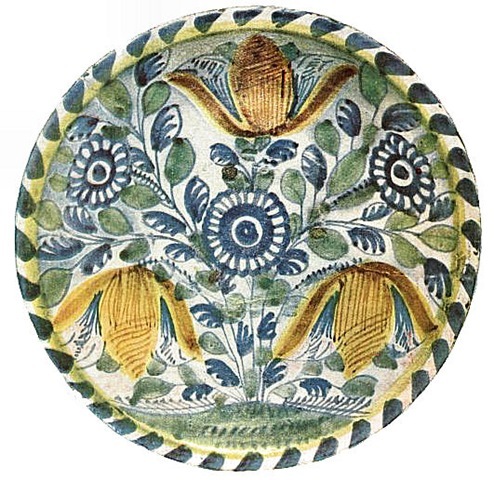 Blue dash was perhaps the only 17th century English pottery made purely for show. Edward Downman coined the phrase “blue dash” in a 1917 monograph on early English pottery. He also set the tone for the ensuing ‘political’ debate by reading allusions to Stuart history into practically every aspect of blue dash imagery and color palette. Still, the majority of blue dash chargers were made during the highly politicized and often bloody years of Stuart rule and decline, including the Puritan Commonwealth interlude. Potters naturally turned their decorative attention to issues of the day. Some potters undoubtedly were partisan. Maybe their political blue dash survived in numbers because loyalist families took extra pains to protect them. Perhaps other potters simply catered to topical concerns with ‘editorial cartoon’ imagery to sell their wares. Or maybe – from the perspective of later pottery – they sold and survived simply because they had blue on them. Blue Dash Chargers and other Early English Tin Enamel Circular Dishes. Edward Downman. T. Werner Laurie, LTD/London. 1919. 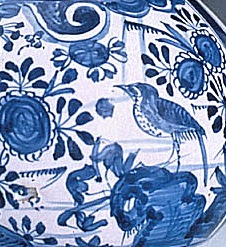 English Delftware. F.H. Garner. Faber and Faber/London. 1948. If These Pots Could Talk. Ivor Noël Hume. University Press of New England/Hanover, NH. 2001). You are currently browsing the archives for the English Delft category.